There are currently 87,458 users on this website. Hello I recently purchased on rare greek banknote,as unc,the issue here is the condition of the note,im posting some pictures to see it,it looks great but with a second view I have spoted (in the 3d picture) a hole there.Now in the picture it may seems small as a pinhole yet ,this is a tear of paper,if you remove the layer there is a hole down there maybe even 0.5cm across, big enough,this seems well covered ,i hope you can understand. 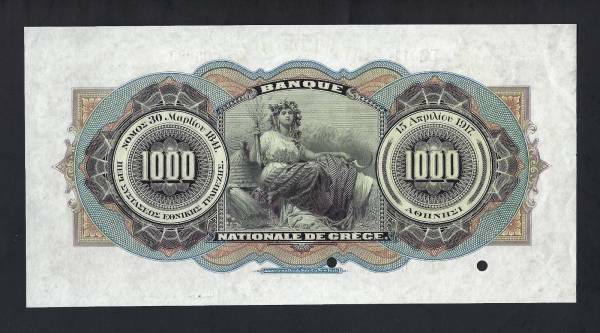 I would really need your opinions on what grade this note will wrote ,since it was bought for this reason,any help will be appreciated,thank you Kostas. To be honest, it is virtually impossible to grade a high-level bank note from pictures along - quite different from a coin. 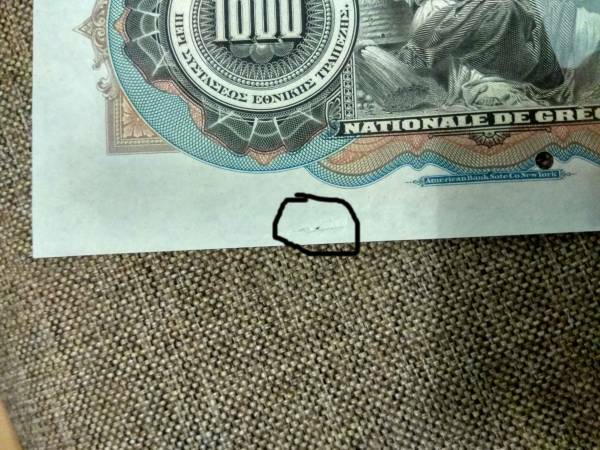 Indeed I do understand that ,yet my question is I believe a general one aswell,this bankote is perfect yet it has a tear of 1cm(its bigger than I listed before).how it will be graded? it will write UNC because the tear is not appearing too much on photos and up close? will it go to aunc because if this ? maybe to Xf because this is a tear and not a pinhole? ijust wonder as there isn't too much information on these cases. One small bend could knock it down to AU. I agree with Frog. It's a specimen note, so it could have been stapled or some how attached into a specimen book. 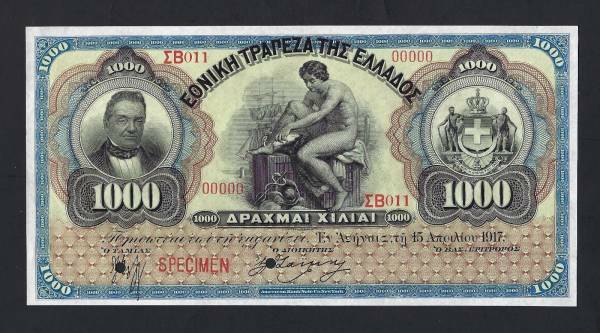 Don't know enough about greek notes. I see a counting flick on the back top right. It is AU at best.